The chapel in the extended greenhouse at Wilton House c.1905. The area now known as Acocks Green has grown up around what were the three hamlets of Flint Green, Westley Brook and Acocks Green. The few Catholic families in the area travelled to Solihull and then later to St Bernard’s seminary (now Olton Friary) to hear Mass. It was only in 1905 that the parish was started and Fr Gibbons was sent by Bishop Ilsley from St Chad’s where he was an assistant priest. What made a resident priest now essential was the arrival of nuns, and other ‘religious’ of the order of Our Lady of Compassion. They had been driven out of France by the anti-religious laws of the time. The Bishop had given ‘Wilton house’, which was to be set up as a convent and a private girls school. This house stood on the ground now occupied by the front of the present church. From the beginning the mission in Acocks Green was dedicated to the Sacred Heart for the Deliverance of the Holy Souls in Purgatory. The first Mass was celebrated in the house on the 13th Of August 1905, however with the arrival of the first students, there was no longer enough space, and a chapel was set up in an old green house with it’s wooden extension. It was here that the church stayed until two years later when in 1907 Holy Souls School was opened to educate the poor in the area. (Now an annexe of Archbishop Ilsley school.) The chapel took up the entire upper story of the new building and was opened on July 28th. Very Rev Canon John Aloysius Gibbons, c.1945. When Fr Gibbons first arrived in the parish he had to live as the guest of Canon Glancy in Solihull. It was intended that he live in the coachman’s cottage of Wilton House. He was however unable to move in until the occupant was persuaded to leave in January 1907. Once in residence he immediately set about enlarging the cottage with the addition of two new rooms. From the very beginning Fr Gibbons had declared his intention to build a permanent Church. In 1913 The Hollies the house next to Wilton House was purchased with the intention of eventually building a Church on the site. In the short term it was to be a playground for Holy Souls School. In 1919 the plans were changed and the Nuns exchanged Wilton House for the Hollies, which allowed all the parish buildings to be together. Later that same year they were able to purchase Malvern House which was between the Hollies and the Red Lion inn. During the 1914-18 war the hardships were very visible to the parishioners of the Church, not only through the volunteers, but also through a number of French refugees who were billeted in the area. At this time Fr Gibbons determined to build the permanent church, and that it should be a memorial of, and a shrine of prayer for the victims of the war. Laying the fuoundation stone of the church on 18 April 1923. It was in 1917 that preliminary discussions took place and with the agreement of Archbishop Ilsley plans were drawn up. In 1922 enough money had been raised to start the work. At first only the sanctuary half of the proposed nave was built. 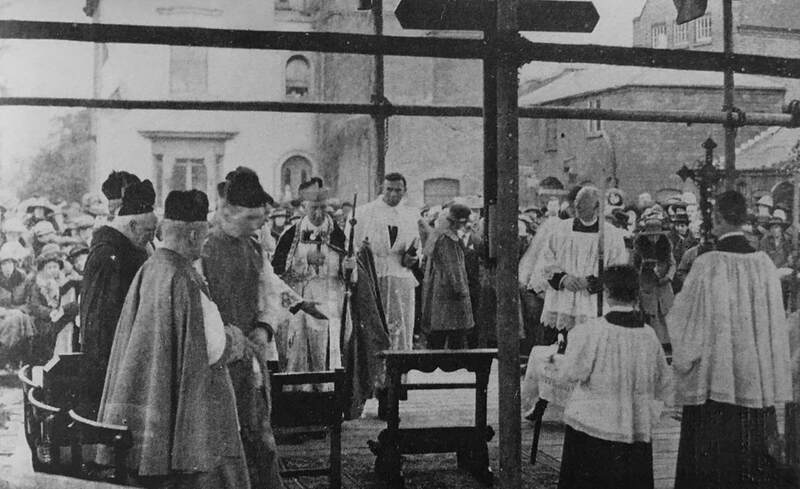 Fr Gibbons himself laid the first foundation brick, with the foundation stone being laid by the Archbishop of Birmingham (Mgr McIntyre) on 18th April. The building was completed and the Church opened on the 26th March 1925. Acocks Green at this time was a rapidly growing community. The railway station had been opened and trams terminated at ‘The Green’. There was a very large growth of council housing, which necessitated enlargement of the school. By 1936 there were three priests in residence and at this time the present presbytery was built. In 1937 the ‘Public Hall’ was purchased for use as a Parish Hall. 1938 saw a proposal to complete the building of the church. Work to build the second half of the nave started in 1939 and was completed in June 1940. A memorial tablet was placed in the porch, listing soldiers who fell in the 1914-18 war. Opposite this a stone was laid which was sent from the ancient cathedral of Rheims. 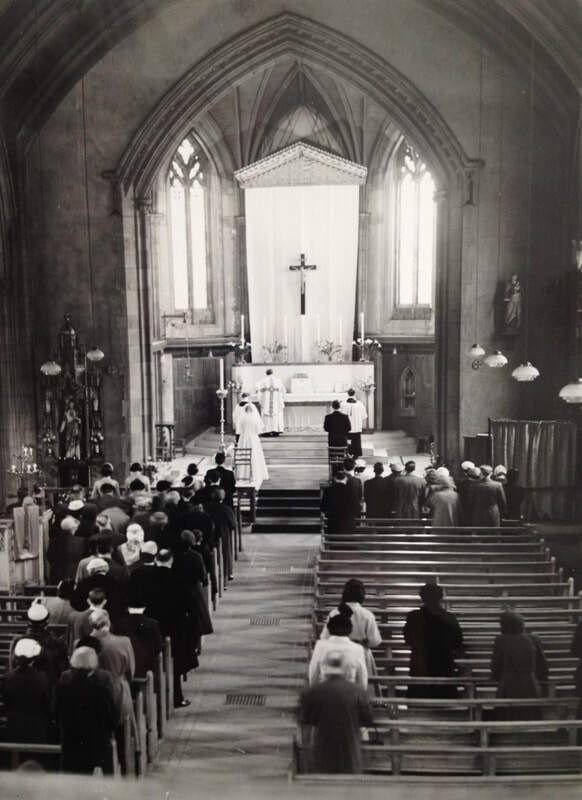 The Church was opened on the 6th June 1940, and consecrated by Archbishop Williams on the 24th October 1945. The church kept changing in appearance as time went on. The sanctuary in the 60s before the remodelling of 1969. In 1948 due to falling numbers, the Convent school closed and the nuns moved to Olton. The two houses and all the extensions were taken over as a boy’s preparatory school called ‘Crosby Hall’. This finally closed in 1966. In the same year a totally separate private boys school in ‘Wellesborne House’ (opposite the parish club) closed, and the church purchased the land. In 1968 Holy Souls School moved to its present building in Mallard Close. This is across the Warwick Rd from the church. During the transitional period the lower floor of ‘Crosby Hall’ was used as extra classrooms. Once the school had moved into its new buildings, the original were later used as an annexe to Archbishop Ilsley School while Crosby Hall became a youth club for a while. 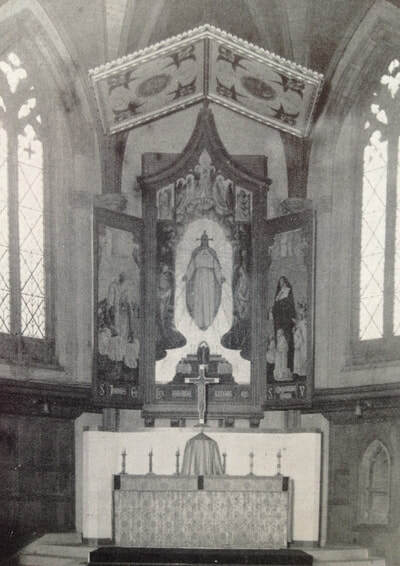 In 1969 the sanctuary of the church was re-modelled and the present altar was installed and the pulpit removed. In 1973 it was again decided that the church was too small for the growing congregation. The gallery was added, replacing a small stone gallery that used to house the organ and choir. 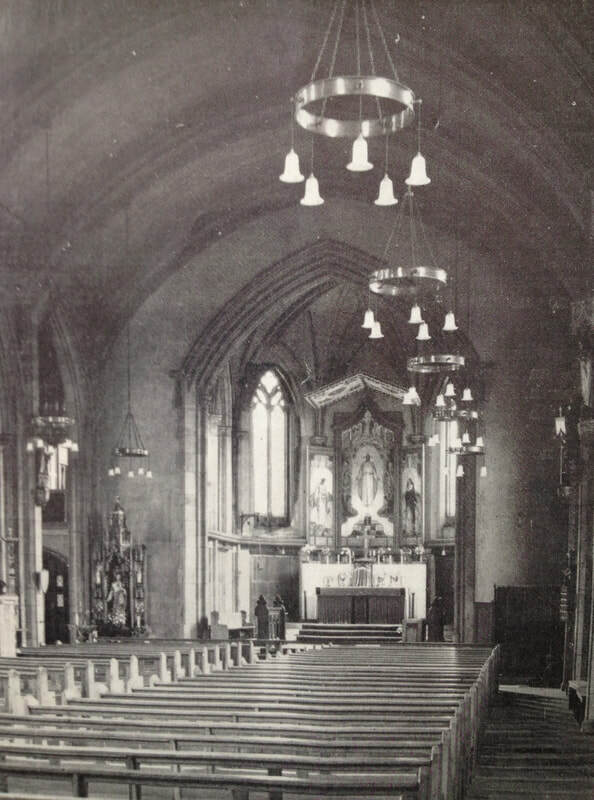 During the period 1997 to 2000 extensive refurbishment was carried out on the presbytery and church. The Church interior was redecorated, and the Stations of the Cross and statues refurbished. Other improvements included a disabled toilet, a hearing loop, new lighting, new public address system, security devices and a new crucifix. Improvement work has continued to the present day, with the parish meeting rooms being completely renovated in 2002.